NEW YORK (AP) — At 87, Christopher Plummer isn’t just working — he’s busy. He has five movies scheduled for release, including “A Christmas Carol” origin story called “The Man Who Invented Christmas.” And he plans to work until the very end, literally. 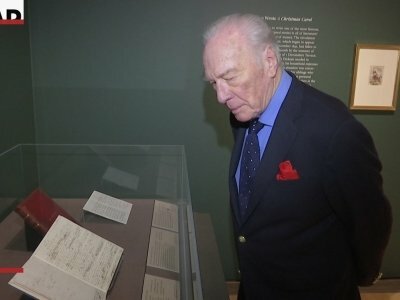 Plummer, who plays Ebenezer Scrooge in the film, recently toured a Charles Dickens exhibit at the Pierpont Morgan Library in New York. Plummer admits that Dickens, especially “A Christmas Carol,” was a big part of his upbringing. “All my family had grown up on Scrooge, and some of them had actually seen Dickens lecture and tell stories. So you took it for granted that it was part of Christmas cheer,” Plummer said. Plummer also has begun shooting scenes for the upcoming Ridley Scott film “All the Money in the World,” replacing Kevin Spacey as billionaire J. Paul Getty. Spacey was ousted from the movie in the wake of a series of sexual misconduct allegations.